Safes are the best way to secure valuables on site-period! They are a little powerhouse of security. They're made to resist physical attack and fire, and they require highly specialized knowledge to bypass a lock if the combination is unknown. Some safes have drops from the outside. When you own a safe, you have a calm sense of security knowing your most valuable items are...safe! Depository Safes: Convenience store type that you drop money into from the outside-like a public mailbox, usually no fire protection and not rated. Fire Safes: Made to protect primarily against fire, usually papers. Less protection in body but increased protection against fire. Burglary Safes: Primarily designed to protect against burglary/forced entry. No fire protection. There are combination burglary/fire safes available. 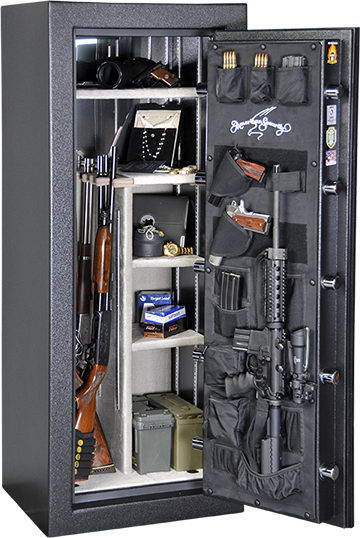 Gun Safes: These safes offer limited fire protection but the interior is built to cushion guns and rifles during storage. Oftentimes these safes are considered "furniture". Floor Safes: These safes are mounted in the floor. Not as popular as they once were, these safes are very secure, offer fire protection based on what flooring they're mounted within, but you usually have to be on your knees to access. Wall Safes: Usually no fire protection, very limited space. The additional security in wall safes is the ability to conceal in closets or behind pictures. Residential Storage Container (RSC): RSCs are able to withstand five minutes of consistent prying, drilling, punching, hammering and tampering attacks by the UL technicians. The steel constructed doors measure between 10 to 12 gauge in thickness. Safes are steel boxes with special locks. The body of a safe along with the type of safe lock determines the rating. Ratings are important to know as they help you to choose the right safe for the items you intend to put inside. Insurance companies also may have certain rating requirements. We have everything you need to secure your home or business!